This is a guest post by Bonnie Golightly. I am near Queenstown, New Zealand. 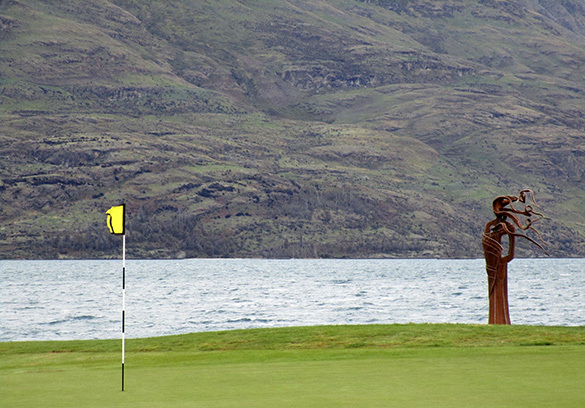 An American golfer admires the view of the magnificent Lake Wakatipu. “I’m just all outa wows!” he says. The golf course is truly lakeside. It is very pretty. My game does not do the setting justice. By the fifth green, I am ready to give up. Out of the corner of my eye, I notice that what I first thought was a weather-beaten tree stump is something much more interesting. I am drawn towards it and….. my O my…. how my heart thumps. Big metallic sister stuff! Mark Hill‘s 2015 untitled sculpture serves up a wonderful surprise in this setting. 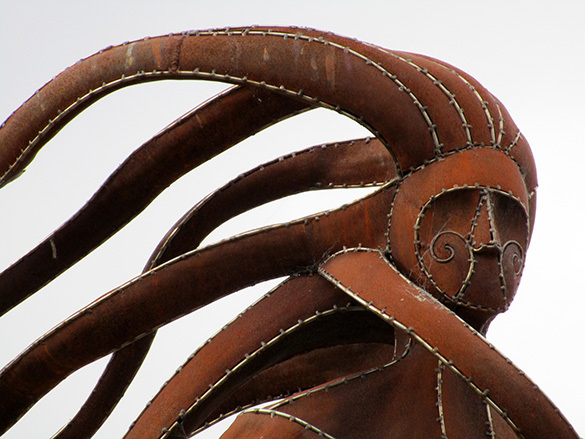 The feminine form is tall, imposing, defiant and very beautiful. I love her. In elegant gown and with hair streaming behind her, she stares out over the lake daring the elements to throw their worst at her. What I admire most is Hill’s technical mastery of his materials. He has used corten and stainless steels to create an astonishing impression of soft leather with bright hand-stitched piping. How he has designed, cut and put together those wind-blown locks is beyond me. This is a work of industry and passion. 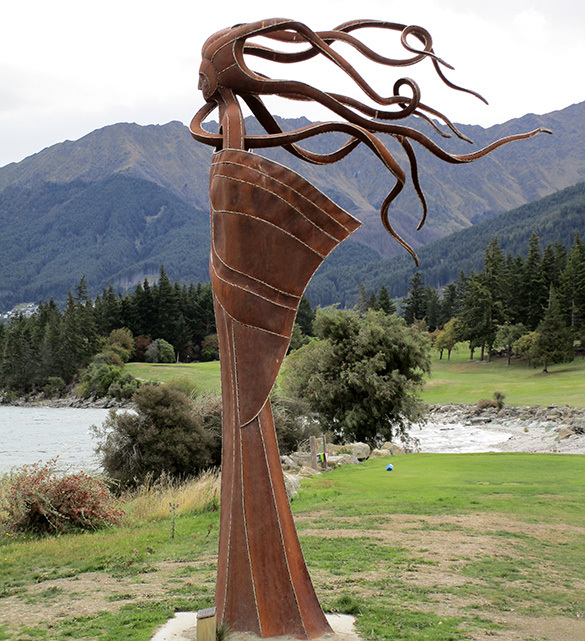 I spend some minutes walking around the Lady of Lake Wakatipu. I even pose a question or two. Does she ever get cold? Does she get lonely? She ignores me of course. But encountering such a resilient woman lifts my spirits. With renewed determination, I make my way to the sixth tee.